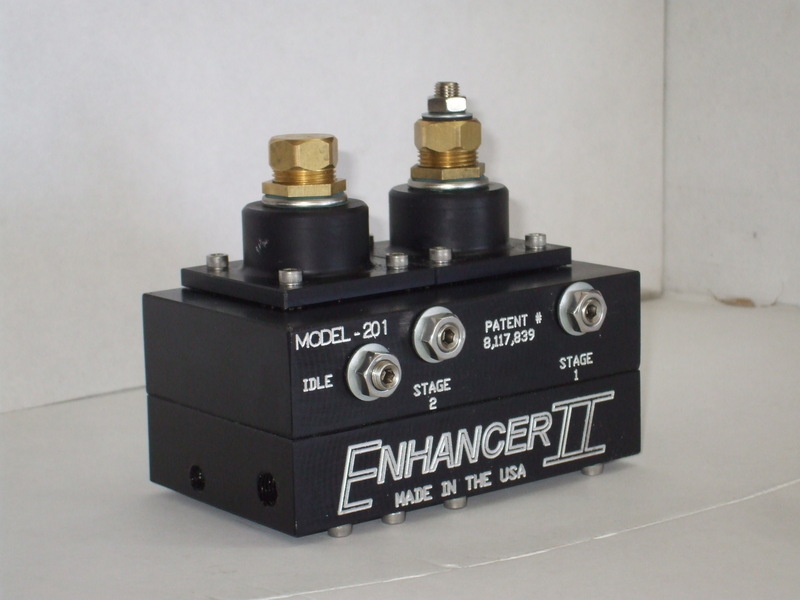 The Enhancer I is perfect for Diesel pickups and standby generators for maximum performance. 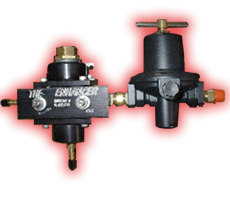 Our Propane Enhancer Kit is the only patent progressive valve on the market. This kit is designed to help you with your mile increase on your fuel on any diesel truck with a turbo. This is a Progressive System that is activated by the turbo boost pressure, injecting vapor propane in increasing amounts through the air-intake as the boost pressure level of the engine increase. The progressive valve begins opening allowing the propane to increase as the boost pressure increases, and then as the boost pressure lowers, the propane flow decrease. The propane works as a “catalyst” when combined with the diesel fuel. When the propane vapor is added to the diesel fuel, almost 100% of the fuel is burned (as opposed to 75% without propane injection) which is what gives you the torque, horsepower and fuel economy. This innovation design is only activated when the vehicle ignition is on and the engine has reached the boost pressure level that the Enhancer start time has been set for. The injection system is controlled by an illuminated on/off switch located inside the cab, giving the driver full control of the system operations. Simplicity is the key to getting the performance and mileage you want out of your truck. Cleaner burning fuel and decreases EGT. Better fuel economy MPG increase. has had system or "2 years" "like no love it" "before pushing 4.08 mpg now 6 mpg" "26,000 miles on an oil change" "I'm not in it for fuel economy, I'm in it for speed". Has had system for "3-4 years" "It works good" "Keeps my motor cleaner, keeps my oil clean . . . so it will keep my engine longer" "I actually have increased my MPG" "It (Enhancer) saves me .12-.13 cents/mile on fuel & thats even after figuring in diesel & LP" "Yesterday, I had 3 different guys ask me about it. And they all ask the same thing, Does it really work? I just tell them what do you think? I'm planning on buying another truck & it will have it (Enhancer)." "The Enhancer is the smartest valve around-hands down." it hard, got around 6 acres an hour. Set a 2 ½ turns start time at 5 pds. Tractor ran about 5-10 degrees cooler. It would have taken 12.3 hours to work the 74 acres and would have used 196 gallons of diesel vs. 82.4 gallons of diesel, 12 gallons of propane and done in 8 hours. Tractors: Extra 30-50 horse and torque, ½ to 1 gallon an hour on propane. Cuts tractor time by 33-40% as far as diesel. Yes, I will provide my own tank. No, I require a propane tank quote. Enhancer II is our product line for Turbo diesel rigs needing the extra horsepower to travel over the road. Imagine having the horsepower available to keep a consistent speed to cover to miles of road for your next delivery. Limited hours of driving should have maximum distance, and the Enhancer II can give you exactly that. Nelse now drives a 2011 Kenworth Paccar engine with DEF and he is using the exact same valve as before.